Joe is currently king of the Pig. Here he is with his first ever buck. A nice 6pt. That smile says it all. So far Joe is the only member with a buck. The rut is not on yet. We saw a lot of deer, a lot of small does to be precise. We kind of lost count. All four of us hunting harvested a doe to get some meat in the cooler and while we were hunting, some meat in our bellies! We hope to be back out in November during the rut so look for some more hunt updates at that time. I’ve started a photo album for the hunt here: 2014/15 Crystal Pig Hunt Club Photo Album. That’s hunt life in pictures. It’s deer season at The Pig (short for Crystal Pig Hunt Club). On opening day Saturday Paul, Luke, Joe and I were on location. We all got a doe that day! Now, it’s time for a buck. We’re not in the rut yet. We’ve seen over 30 does and only 2 bucks so far. 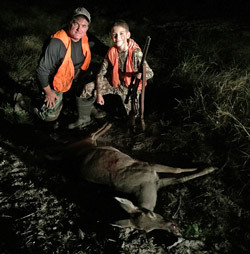 In the pick, Joe gets his first deer, pictured with his Dad and my brother Paul. You want to talk about excited. He got it with his first shot too. So, we’ve had some good fresh venison on the grill and in a stew and I think some more recipes are coming. Now back to the hunt. 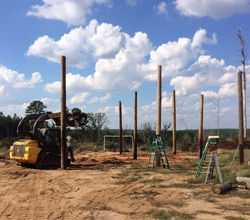 Our last major project of the year prior to hunting season is the building of a pole barn. This week the poles got planted and next week the frame, rafters and metal roof goes on. The barn will house our RV with lots of extra room for shelves and a cook area. Of course there are lots of little projects we still want to work on including some more stands at key locations. However, we’re ready to spend some time in the woods on the CPHC with a gun! It’s getting close and we’re getting excited. How about you? Are you going deer hunting? Got any questions? We’ll try to answer them. Feel free to post in comments. The excitement is building as we get close to deer season. 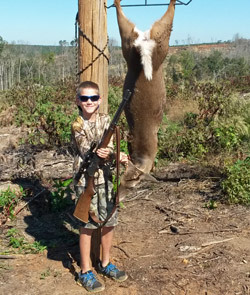 We have learned a lot about preparing food plots this summer. More on that later. One of the last preparations involved setting up and filling the corn feeders. We have two that are strategically placed to help draw deer into the property. 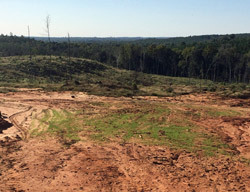 Since this property was clear cut for hard woods there is less cover than the surrounding pine forests. 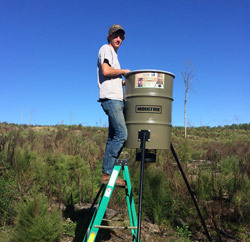 Here’s Luke up on a ladder adding corn to our newest feeder. We have them set to distribute corn a few times a day. During this same trip Luke and Paul got several more stands set up and locked down. Hunt time is getting close and we’re getting excited!